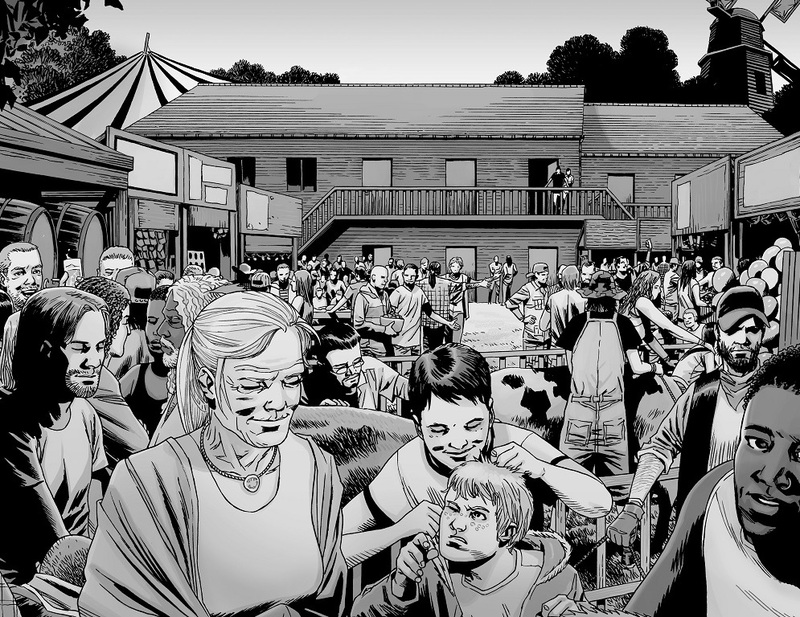 A Look at The Walking Dead #142: “A Gathering” | What Else is on Now? After so much development has taken place as a result of the time skip, we see the culmination of hard work citizens have put into this festival. Oh, and hey, brief reappearance of Magna and company. But before getting there, let’s start with the beginning of the issue, which picks up directly after the ending of the previous one. So Maggie knows that Gregory’s execution is sure to cause division amongst citizens. Hell, there’s already division within the neighbors anyway since many of them don’t like Maggie’s style of leadership. However, with Gregory’s death, this may lead to more of a headache for her. She doesn’t want it to be the start of something, but there has been something brewing long before this. I’d say that it started when some of the local boys attacked Carl and Sophia, but right now, Maggie wants calmness in a sea of so much division, but she has to know that this won’t be the end of the conversation. And she probably wouldn’t expect it to be. 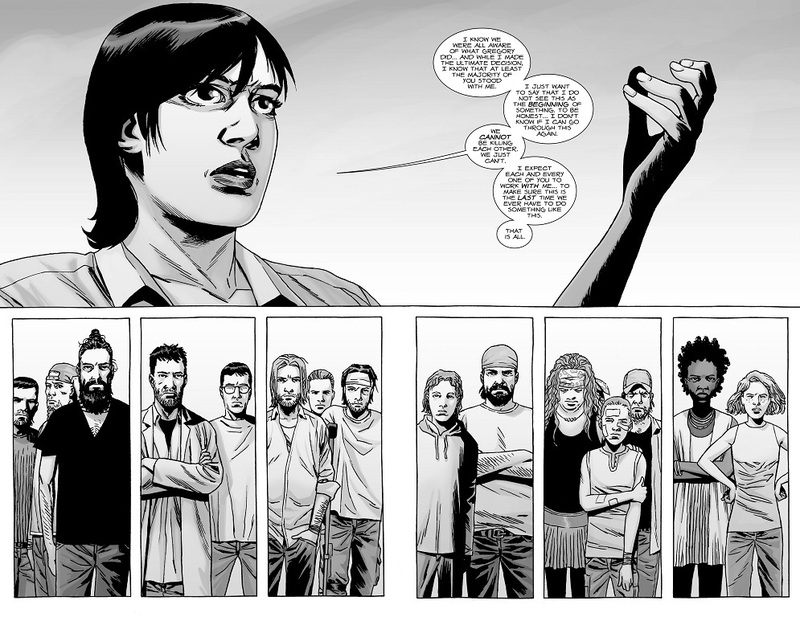 If anything, maybe there will be less of an uprising now that people know what Maggie is capable of, but that would go against Maggie and Rick’s leadership styles if it’s based on fear. All just speculation here. In Alexandria, it is amazing to see how society has progressed. I know I’ve said that before, ever since we got to the time skip, but the look on Andrea’s face really shows just how much even she can’t believe that she’s living in the same world where people used to spend their lives running from roamers. Sure, roamers aren’t a thing of the past, but they’re less of a threat now. As such, we have some semblance of normalcy or a close return to it. It’s too good to be true, but these people have worked for it. It’s nice to see their work actually bearing fruit. It was only a matter of time before Maggie informed Rick about what happened to Carl and the introduction of The Whisperers, and Rick’s anger is justifiable. Even though Carl isn’t a kid anymore and should be responsible for himself, Rick still entrusted him to Maggie and not only is Carl gone, but Rick is only now just learning this, after everything the two have endured. And Rick hasn’t had to go through any major hardships lately, so this is a shock to him. However, that’s exactly the point, as he didn’t have someone try to poison him. 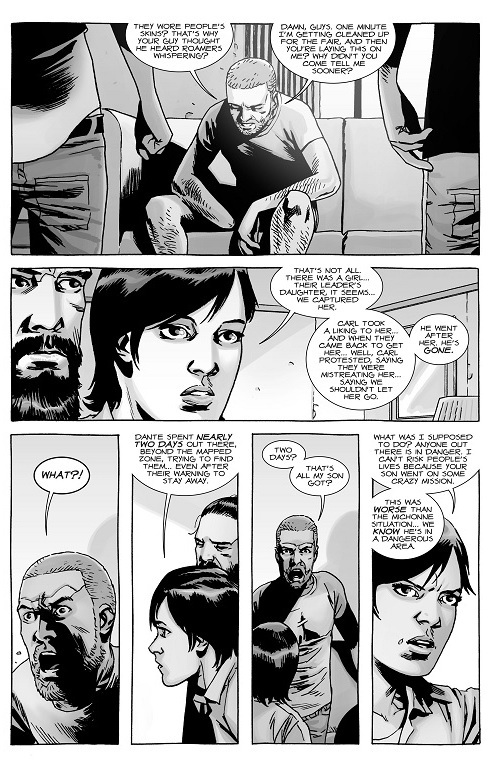 Now Rick is a reasonable man, but he’s not one to just calm down easily unless someone forces him to, so I’m a bit surprised that he chilled out as soon as he did when Jesus revealed why Maggie had such a hard time. 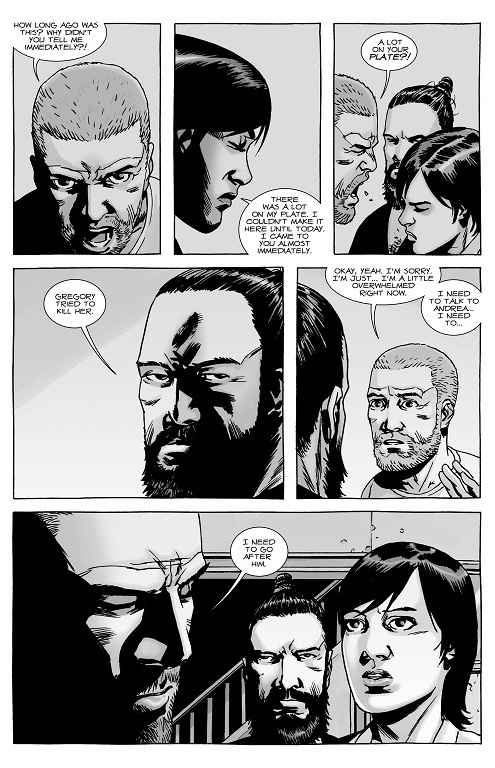 It’s also interesting that Maggie left out the part about executing Gregory, since that would put her and Rick at odds so soon after they’ve reunited. 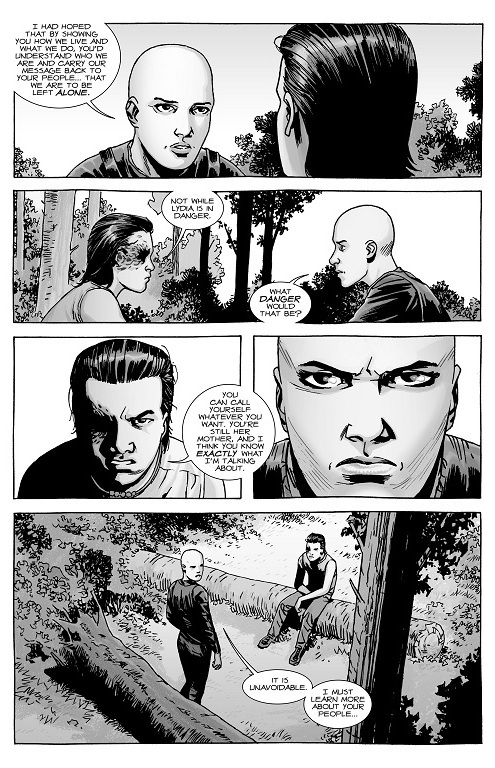 But given how much Rick is determined to make this life work and prove Negan work, things won’t go over well once he learns what Maggie has done. 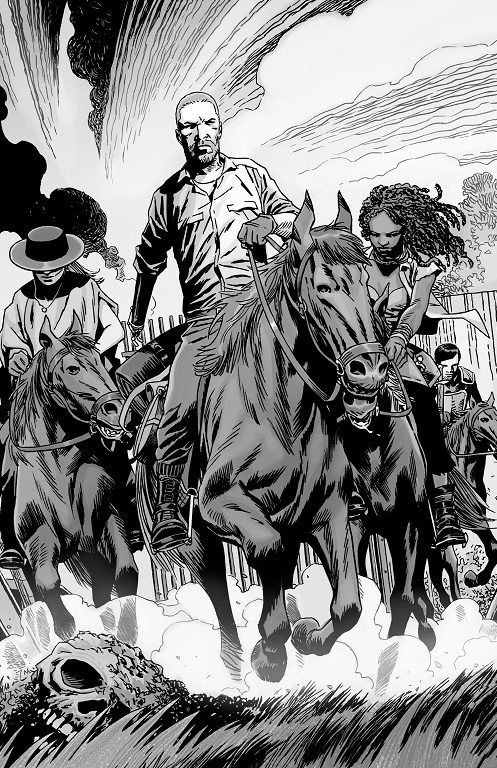 Oh, side-note, I love the panel of Rick, Michonne, Andrea, and Dante riding off. 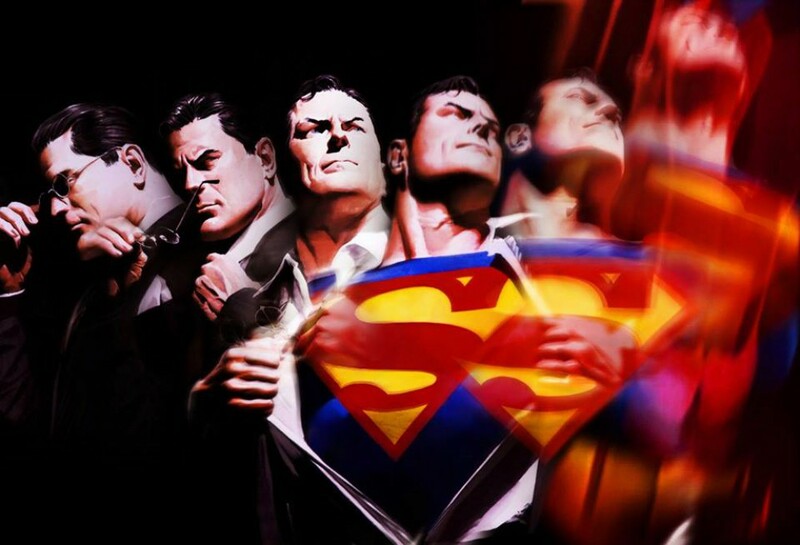 Such a cool shot, in my opinion. 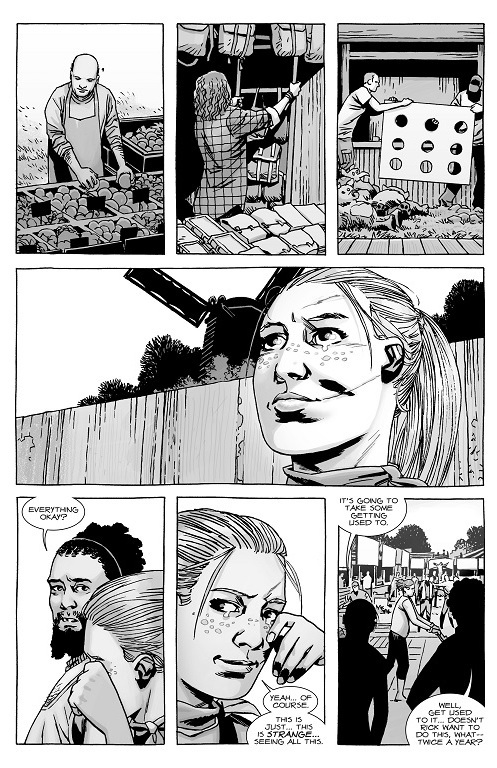 As for the Whisperers themselves, Alpha seems a very different sort of…well, I can’t call her an antagonist or villain, in the same way I would Negan or the Governor, but just a different sort of leader. The Whisperers have a different way of living, but for the most part, they want to be left alone. They can’t do that when they’ve got people like Carl tailing them because he’s lovesick for Lydia. This doesn’t mean that everything they do is civilized, as they don’t go by names and still commit certain acts that Carl doesn’t approve of, but they want to remain amongst themselves. And with Alpha managing to infiltrate the fair, it remains to be seen just what she wants to learn. A good issue, really. Rick and Maggie reunited while learning about their potential common enemy, while Alpha has slipped within the confines of the Alexandria Safe Zone to learn about Carl’s group. 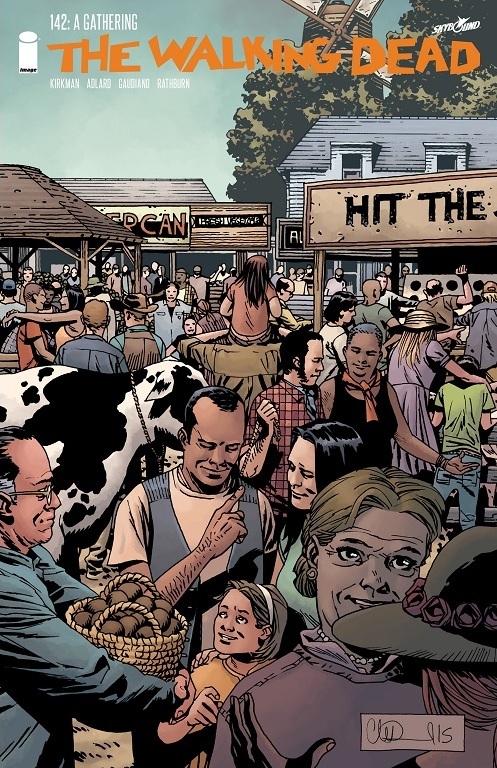 There’s no follow-up to the Negan situation, which is a bit disappointing, considering how much of the last issue it took up, but maybe that’ll be saved for later. This entry was posted in The Walking Dead and tagged Alpha, Andrea, Carl Grimes, Dante, Jesus, Lydia, Maggie Greene, Magna, Michonne, Rick Grimes, Sophia, The Walking Dead, The Whisperers by omarid513. Bookmark the permalink.